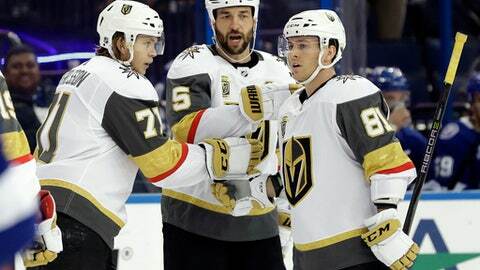 TAMPA, Fla. (AP) Marc-Andre Fleury made 28 saves, David Perron had a goal and an assist, and the Vegas Golden Knights beat the Tampa Bay Lightning 4-1 Thursday night in a matchup of conference leaders. Fleury made a number of impressive stops, including a left-circle shot by Steven Stamkos and in-close chance from Nikita Kucherov during the second period. The goalie, who spent most of career with Pittsburgh, is 19-11-4 against the Lightning. Neal opened the scoring with a nifty deflection 56 seconds into the first, and Schmidt made it 2-0 with 3:57 left in the period. Deryk Engelland got his 100th NHL assist on Neal’s goal. NEW YORK (AP) – Patrice Bergeron scored three goals to lead Boston to another victory, giving the Bruins at least a point for the 15th consecutive game. Brad Marchand had a goal and two assists as Boston improved to 11-0-4 since its last regulation loss Dec. 14 against Washington – its best stretch since going 15-0-1 from March 2-30, 2014. Ryan Spooner had a goal and an assist, and Anton Khudobin stopped 22 shots. Jordan Eberle and John Tavares scored for New York, which has dropped seven of 10 – with each of the losses coming in regulation. Jaroslav Halak made 29 saves while facing fewer than 35 shots for the first time in his last 11 games. PHILADELPHIA (AP) – Sean Couturier scored 18 seconds into overtime and Philadelphia rallied for the win after retiring the No. 88 jersey of Hall of Fame center Eric Lindros. Couturier took a feed from Travis Konecny and beat Frederik Andersen with a wrist shot to give the Flyers their fifth win in six games. DENVER (AP) – Nathan MacKinnon scored twice during a 58-second span in the first period, Matt Nieto added a late insurance goal and Colorado ran its winning streak to eight straight. Carl Soderberg also scored and Mikko Rantanen had a goal and two assists for the Avs, who have won eight in a row for the first time since the 2005-06 season. It’s tied for the third-longest streak in franchise history. Joe Thornton, Timo Meier and Marc-Edouard Vlasic scored for San Jose. Jonathan Bernier stopped 45 shots to run his winning streak to a career-best seven games. He is filling in with starter Semyon Varlamov sidelined by a lower-body injury. LOS ANGELES (AP) – Patric Hornqvist scored two goals and Evgeni Malkin got the tiebreaking goal early in the third period of the Penguins’ fifth win in six games. Casey DeSmith stopped 28 shots to earn his first NHL victory in his third career appearance for Pittsburgh. Malkin had a goal and an assist as the Penguins bounced back from a loss in Anaheim one night earlier with a solid effort at Staples Center in the second stop of the back-to-back Stanley Cup champs’ three-game California trip. Hornqvist scored in the opening minute and got another during a five-minute power play midway through the third after Dustin Brown got a game misconduct penalty for sending a kneeling Justin Schultz into the boards near the Kings’ bench. Adrian Kempe scored and Jonathan Quick made 28 saves for the Kings, who have lost five straight for the first time this season. NEWARK, N.J. (AP) – Taylor Hall scored on a breakaway 34 seconds into overtime, lifting New Jersey to the victory. Sami Vatanen collected his third assist of the game on the winning goal, a shot over the shoulder of goaltender Braden Holtby. Drew Stafford, Andy Greene and Miles Wood also scored for the Devils, who have won two straight since a six-game winless streak (0-3-3). Keith Kinkaid had 16 saves and the Devils killed off all five Washington power plays. Brett Connolly scored twice and Dmitry Orlov had a goal for the Capitals, who lost for only the second time in eight games. Holtby made 28 saves, but gave up three breakaway goals. COLUMBUS, Ohio (AP) – Artemi Panarin scored in the second round of a shootout, sending the Blue Jackets to the win. Joonas Korpisalo had 35 saves for Columbus, which returned from its five-day break after losing both ends of a back-to-back last week. Jordan Schroeder scored his first goal of the season in the first period. Korpisalo blocked a shootout try by Jason Spezza before Alexander Radulov and Tyler Seguin came up empty. Dallas goaltender Ben Bishop blocked Jussi Jokinen’s shootout attempt before Panarin beat him. Alexander Radulov tied it for Dallas with 2:05 left in regulation. Bishop had 25 stops, including a terrific glove save on Alexander Wennberg with 30 seconds left in the third. NASHVILLE, Tenn. (AP) – Craig Smith scored the deciding goal in the shootout to give Nashville its fourth straight win. Scott Hartnell and Ryan Ellis scored for the Predators, and Pekka Rinne made 27 saves. Oliver Ekman-Larsson and Brandon Perlini scored for Arizona. The Coyotes have lost five straight. In the fourth round of the shootout, Smith beat Arizona’s Antti Raanta with a quick wrist shot low to the glove side. OTTAWA, Ontario (AP) – Vladimir Tarasenko, Alex Pietrangelo and Brayden Schenn scored in the second period, helping the Blues to the road win. Alexander Steen added an empty netter at 18:42, and Carter Hutton made 20 saves. Bobby Ryan had the lone goal for the Senators, and Craig Anderson made 33 saves. Ottawa was coming off its bye week and hadn’t played in eight days. NEW YORK (AP) – Pavel Buchnevich scored the go-ahead goal late in the third period, leading the Rangers to the victory. Rick Nash scored twice for the second straight game and Henrik Lundqvist made 34 saves for New York, which won their second straight after three consecutive losses. Buchnevich knocked the puck past Robin Lehner at 16:02, a minute after the Sabres tied it for the third time on a goal by Rasmus Ristolainen. The goal was the 12th of the season for Buchnevich, who also had two assists. The Rangers (24-17-5) have won 11 of their last 14 games against Buffalo, which fell to an Eastern Conference-worst 11-25-9. Justin Falk and Kyle Okposo also scored for the Sabres. It was Falk’s first goal of the season.